As farmers flock to Shanghai for a better future, they find an invisible barrier between their children and local students. Qian Yanfeng reports from Shanghai. When Wang Zefang arrived for his first class at Gaojin No 3 Middle School two years ago, he was among thousands included in Shanghai's trailblazing plans to integrate children of migrant workers into free mainstream education. Before then, State-run and public schools were closed to families without hukou (permanent residency), forcing them to pay for their children to attend private but poor institutes. Yet, despite being taught alongside his native peers, 16-year-old Wang is under no illusion that the invisible fence between them has been knocked down. Of the 300 migrant children who arrived at the Baoshan district school in 2008, Wang was one of a handful admitted into regular classes. The others are housed in a separate school building, wear an alternative uniform and have different teachers and textbooks. Even meal times and finishing times are different. "I feel distinct discrimination against us, it has just been brought inside the school walls," said Wang, who had to pass an exam to be accepted into the main school. Teachers warned his class to stay clear of the migrant children, describing them as "wild", "lacking in manners" and "poor". "Because of the divide, I have not talked to any students in the other building all semester," he said, adding that he can imagine "how sad they must feel facing such segregation on a daily basis". Although Wang is one of the lucky ones, he explained that his younger sister, Wang Xuemeng, is on the other side of the fence at a public school in neighboring Yangpu district. "The conditions are better there than the private school she used to go to but she often complains of unfair treatment and is not happy," said the concerned brother. "She says both the teachers and parents (with hukou) feel migrant worker families set a bad example, so they are not friendly towards them." Almost 20 percent of Shanghai's population is made up of farmers who flock to the metropolis each year in search of better salaries, bringing with them more than 400,000 children. For years under the much-maligned hukou system, migrant children have been unable to enjoy the nine years of compulsory education in their adopted homes, creating a huge demand for private schools. However, in recent years Shanghai has been among the first Chinese cities to close such facilities - most of which suffer a lack of resources and poor standards - and enroll students at public schools as part of a nationwide campaign. The city government also bought several decent private schools and injected more funds to improve standards. Most of the 100 or so private schools in Baoshan district, an area popular with migrants due to its cheap housing, were shuttered by 2008, with only 16 primaries kept open to cater to 14,000 students. About 40,000 other youngsters were spread out across the district's public schools, authorities reported. Shanghai's educational commission stated that, by the end of the year, all migrant children in the city will have access to its free compulsory education. The program has been hailed as a significant step in the reform of China's education system, yet the segregation of students from different backgrounds (the exact number of schools doing so is not available but experts suggest it is common practice) has sparked fresh concerns over the equality of education in the country. "Students like us have to be outstanding to be allowed into public schools and get the same standard of education as the locals. If not, we're placed in separate classes," said Wang Zefang. There are still limits to what migrant children can accomplish, he said, "such as it would be impossible for me to get into a first-class public schools no matter how well I perform." Yu Haizhou, head of Gaojin No 3 Middle School, denied any suggestion the school discriminates against migrants by putting them in different classrooms. "We used to have 600 students, so you can imaging what a big burden on our educational resources it was to take in 300 students all at once," he told China Daily. "We made the most convenient choice and maintained a division between them. "It's a question of management, not discrimination," he insisted, adding that huge differences in study levels also posed difficulties. 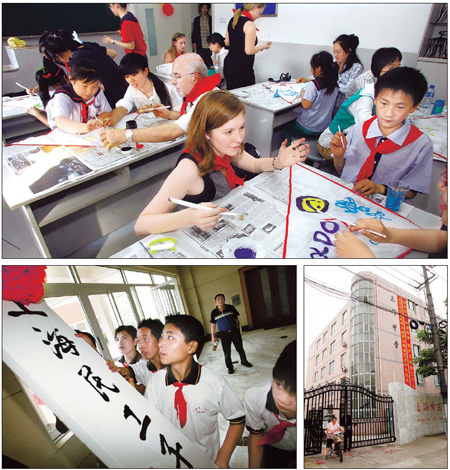 Migrant children in Shanghai use nationally standardized textbooks, while natives use books produced locally, which are far advanced in some subjects, particularly English. "Also, migrant students are not allowed to sit secondary school and college entrance examinations in Shanghai (or in any other city where they do not have hukou)," he said. "They have to return to their hometown, where the test will be based on the nationally standardized textbooks. "So it really doesn't make sense to teach these students together with the locals," the head teacher added. The fact students eat and leave at different times is to prevent congestion at the school canteen, he explained. "Our school is already too small for 600 students, let alone for the new additions." Yu revealed that parents put the school under a lot of pressure not to integrate its students because they fear it could hinder their child's development. "We know this could be seen as prejudice but the fact is, on average, the migrant children are at a lower level in their studies and are a lot more difficult to teach due to their poor living conditions," he said. "They move from place to place, change schools often and most of their parents do not pay enough attention to their education. "What we can do right now is to encourage more communication between the two groups and hopefully minimize the gaps and misunderstandings." 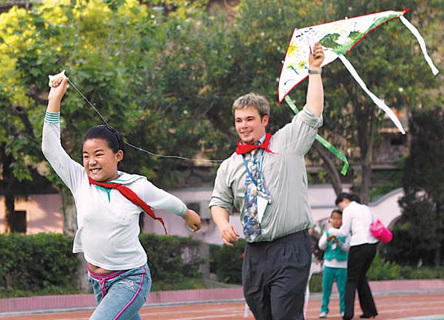 However, Zhang Yichao, founder of a voluntary center dedicated to providing free extracurricular education for migrant students in Shanghai since 2002, disagreed that differences in academic performance are a major hurdle to having children share the same class. "Many people simply don't know how diligent these migrant students are," he argued. "Judging from my experiences, after a year of hard work most of them would be able to catch up." Segregation in public schools will ultimately have a negative psychological impact on both groups of students, he warned. "It's even worse than having schools exclusively for migrants. They may have poor standards but at least there the youngsters can feel equal with their classmates," he said. "The government has failed to take into account the potential impact of the new policy, which has actually sacrificed the interests of many innocent migrant children." He urged the authorities to allow students to sit exams at the schools they attend to help remove the barriers in education and allow more people to go on to higher education. Despite growing calls for the government to reform the hukou system, though, some education chiefs say cities like Shanghai would be unable to handle the inevitably large influx of migrant students, who would all stand a better chance of qualifying for the top universities. Such a move would only put extra pressure on educational resources, said Zong Weirong, head teacher at Luoxi Primary School, one of the 16 private schools taken over by Baoshan officials. However, Gu Jun, a professor of sociology at Shanghai University, insisted the opening-up would not result in a substantial surge in the migrant population as many would be deterred by the high cost of living. Even if it did attract more people, it is the responsibility of the central government, not the local government, to allocate more funds for a city to expand its educational resources, he said. That way, authorities would not come under financial pressure, he added, and "in time it may even help a city to develop into a world-class center famous for its quality education". Gu did agree, though, that the separation of students in public schools is fairly rational under the current national conditions, which are likely to exist for the next 20 years. Given the hukou system and the huge gap between China's urban east and rural west, both in economic development and education, it is "impractical" and "impossible" for schools to integrate the two groups, he said. "Separation is the last resort," he said, "but it can at least act as a buffer zone to help children to adapt to the changing environment." However, once migrant students manage to catch up with natives or prove themselves capable, they should be given a choice where they want to study, he said. "We must ensure migrant students enjoy the right to compete," added Gu.